Lifting weights is great, but to get the most out of resistance training, sometimes you need to mix it up! 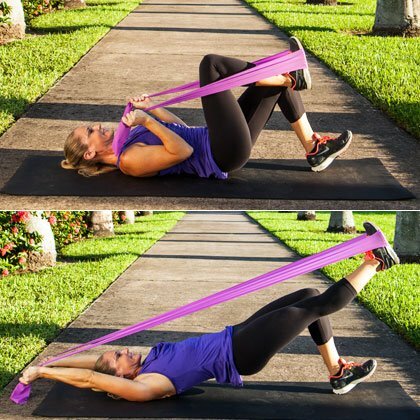 With this exercise, all you need is one portable, affordable band to fit in a head to toe sculpting session anytime and anywhere. Workout: Do 1 set of the prescribed number of reps for each exercise with little to no rest between each move. When you finish the entire circuit you will need to rest for 1-2 minutes and then repeat the whole thing 2 more times. Do 3 circuits in total. 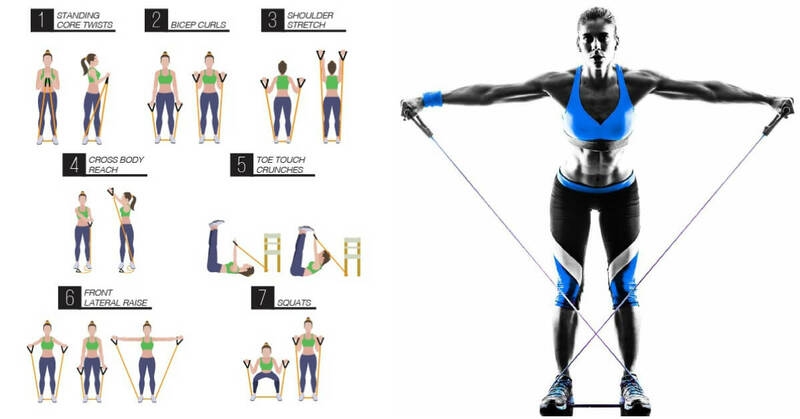 Training tip: Resistance bands vary in size, shape and thickness. You may need to modify or change the way you use your band. Stand in a split stance with your right leg forward and left heel lifted. Fold your resistance band in half and hold it parallel to the ground in front of your chest, palms facing down. Bend your elbows and stretch the band wider as you row the band into your chest. Keep your shoulders down and squeeze your shoulder blades. As you row, rotate your torso to the right while lowering into a lunge. That’s one rep now do 10 reps on the right side and 10 on the left. Training tip: Pull your abs in tighter as you rotate your body and lower into the lunge to help maintain your balance. Stand tall with your knees and toes slightly turned out and your heels pressed together. Hold the folded resistance band overhead. Step your right foot out wide to the side and immediately bend both knees and lower into plie squat position, stretching the band wide as you pull it down in front of your chest. Slide your right foot back into your left as you reach the band overhead and return to the starting position. That’s one rep now do 10 reps with your right leg and 10 with the left. Training tip: Keep your abs drawn in tight during the entire exercise and focus on squeezing your inner thighs together as you slide your foot back into the start position. Grab one end of the resistance band in each hand and stretch it across your upper back/shoulders (the band should be under your armpits). Get into a push up position with your feet together, holding the ends of the band in place with your hands. Lower your body to perform a full push up and work up to 15 reps in a row. Training tip: If push ups are too tough then do the modified version on your knees. For more of a challenge, increase the resistance by shortening the band. If you’re not working with a flat band, you may want to drape a towel over your upper back to avoid any burn off the band. Hold both ends of the band evenly and step your left foot across the centre. Lunge your right leg forward, your left leg should remain straight. Curl the ends of the band into your body, keeping your elbows in tight by your sides and palms facing up. Press your arms out in front of your chest, palms facing up and elbows slightly bent. Bend your arms back in by your sides and then lower. That’s one rep now do 10 reps with the right leg forward and 10 with the left leg forward. Training tip: Engage your abs, press your shoulders down and keep your upper body as still as possible during the curl and press movements. If you need more resistance then move your grip lower on the band. Start in a split stance with your left foot forward. Place your left foot on the centre of the band, holding both ends with your right hand. Lower into a lunge, reaching your right hand towards the inside of your left foot. As you rise out of the lunge, row the band back, pulling the ends of the band to the right side of your body. That’s one rep now do 15 reps with the right leg forward and 15 with the left leg forward. Training tip: Brace your abs in tight and maintain a straight line through your spine as you reach and row. Your shoulders and torso can twist during the reach and row movement, but don’t let your shoulders round forward. Sit with the band looped around your feet, knees slightly bent, holding the ends of the band evenly with your palms facing down. Hinge back, twisting your upper body to the right as you open your arms your left arm extends up by your ear and the right arm extends down and out to the side. That’s one rep now do 20 reps total and alternating sides each time. Training tip: As you lean back, keep your spine naturally arched, your chest lifted and abs engaged so you don’t collapse into your lower back. Sit tall with your knees slightly bent and the band looped around your feet. Focus on using your back muscles to bend your elbows in by your sides, holding the band with your palms facing down. Brace your abs in tight, lean your upper body forward and extend both arms behind your body, keeping your spine naturally arched. That’s one rep now do 20 reps total. Training tip: Focus on pressing the band behind your body with the backs of your arms. For more of a challenge, increase the resistance by lowering your grip on the band. Lie face up with your knees bent and your feet flexed so that just your heels touch the floor. Loop the band around the bottom of your right foot and hold both ends evenly with your arms bent and palms facing in. Lift your hips off the floor and extend your right leg out about 45 degrees. Your right knee should be in line with your left, as you press both arms overhead. Lower your hips and return your arms to the starting position. Training tip: Keep abs drawn in and exhale as you extend your arms and legs, pressing your belly button in closer to your spine as you breathe out. Inhale as you return to start.